It turns out that no, presidential hopeful Hillary Clinton did not ascend the stage at a rally in Philadelphia to a song by the Freedom Kids, which is a blessing unto us all. Knowing her audience, Clinton instead celebrated her primary victory in Pennsylvania—as well as Delaware, Connecticut, and Maryland later on in the night—by blasting “Eye of the Tiger,” because the only thing she’s missing from becoming a Rocky Balboa protege is not doing this while wearing a read sweatband. 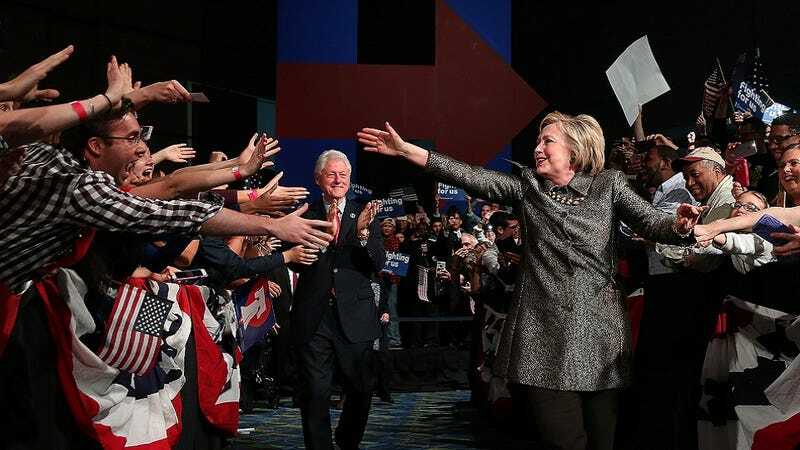 According to the latest poll results in the 2016 Democratic primary, Clinton seized Pennsylvania with 56% of the vote, Delaware with 60%, Connecticut with 50%, and Maryland with 64%. Her opponent Bernie Sanders took Rhode Island by 55%. During her address to the crowd, which was made before the announcement of her projected Connecticut win, Clinton called for both a unification of the Democratic party and a call to arms in the general election.